Football is back! 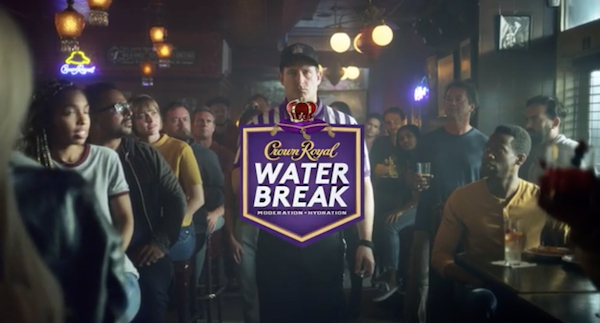 To celebrate Crown Royal is launching its largest-ever responsible drinking campaign: The Water Break. The Water Break is a movement that encourages responsible game day consumption and reinforces the importance of drinking in moderation and hydrating between alcoholic beverages. Crown Royal will support the fully integrated Water Break program with the following a nationally televised 30-second commercial set to air during the season opener that will continue to air during the first half of games throughout the entire season. This marks the second the second year Crown Royal will utilize football advertising to promote social responsibility. There will be a full roster of football legends including Ed Reed, DeMarcus Ware and Brian Westbrook to support the program on social, through media interviews, and in-person deliveries of water to fans at select stadiums and bars. Westbrook kicks off the program tomorrow during the game in Philadelphia. There will be distribution of tens of thousands of gallons of water in stadiums and bars and provide safe rides home to create a safer, more enjoyable game day. Integration of the movement into all team and stadium partnerships and its largest media investment to date dedicated to social responsibility, increasing its visibility from last season. Print article This entry was posted by Art Eddy III on September 8, 2018 at 5:02 am, and is filed under Lifestyle. Follow any responses to this post through RSS 2.0. Both comments and pings are currently closed.